Paresh Chattopadhyay's review of Paul Burkett's book. 'Marx and Nature'. This is an important book. Its great merit lies in a clear presentation of Marx's position on nature in its relation to human beings as well as a convincing defense of Marx against his ecological critics. The book has 14 chapters spread over three parts: nature and historical materialism; nature and capitalism; and nature and communism. The first part starts by laying down the criteria for a "sound social ecology," arguing that Marx's materialism fulfills these criteria. This is followed by a discussion of Marx's conception of nature's contribution to the production of use values and a refutation of the common view that Marx downplays the role of natural conditions in the process of material production. The first part ends with a consideration of Marx's conception of production as being simultaneously material and social corresponding to the simultaneously material and social character of human labor power in relation to production. In the second part, the author, after observing that capital determines people-nature relations through its dual subjection of labor and nature in a more profound way than the earlier modes of production, goes on to investigate the ecological implications of Marx's value analysis and shows that only the latter enables us to understand the contradiction between wealth as the combined product of nature and labor, as use value, and wealth represented as abstract labor time, as exchange value, while emphasizing that there is no market solution to the environmental crisis (under capitalism). Finally, in part three, the author explores the way in which the ecological question figures in Marx's idea of the capitalist crisis and his vision of the free association coming out of the womb of capital. 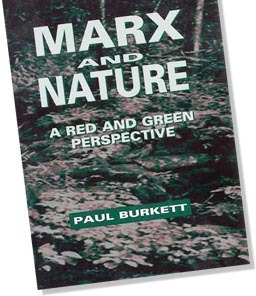 The author ends the book by stressing that Marx's vision of the future free association, far from sharing any Prometheanism - as alleged by his ecological critics - allows for a proper management of society's use of nature and a congenial context for a healthy and sustainable cooperative relation between people and nature. The book has, in its unusually wide ranging analysis, explored very well the different dimensions of the ecological crisis arising out of the contradictions of capitalist production, shown the impossibility of any solution within capitalism and, in the process, convincingly demonstrated how most of the attacks against Marx by his ecological critics are unfounded. While I am in basic agreement with the content of the work, I would like to offer a few comments on several points. First, the author speaks of Marx's "combination of historical specification and materialist analysis" as well as of his "materialist and social-relational analysis" (7, 80, 52, 53). I would submit that Marx's "new materialism," contrary to the "old," necessarily implies historical specification and that Marx's materialism precisely includes and posits social relations (of production) as the "economic basis of society." Second, according to the author what "Marx calls the `real subsumption of labor under capital' is the harnessing of workers' living and working conditions to an increasingly social production process evolving according to monetary criteria" (67) . I submit that while this is certainly implied by capitalist production in general, this does not bring out the specifity of the real subsumption of labor which Marx ascribes to it. According to Marx, as opposed to the formal subsumption of labor under capital, which is simply the direct subjection of the labor process under capital based on absolute surplus value without any basic change in the method of production, real subsumption signifies a "complete revolution in the method of production itself operating in all the forms which develop relative as opposed to the absolute surplus value" (Results, 1863-65). Third, the author finds a "contrast" between Marx's characterization of the proletariat in the Manifesto as a well disciplined revolutionary agent and his characterization of the proletariat "elsewhere" as "paupers," signifying by implication its inability to serve as such an agent (208). I submit first that the "contrast" is present in the Manifesto itself, inasmuch as the Manifesto presents the "gravediggers" of capital as having "no property and nothing of their own to safeguard," as a "simple accessory of the machine." Second by "pauperism" of the laborers Marx means their total alienation form the objective conditions of production, their "total loss of humanity." For Marx, precisely because the proletariat "feels destroyed by alienation and finds in this its own powerlessness, it acquires the theoretical consciousness and is constrained by misery to revolt against it" (Holy Family). In the same manuscripts where Marx specifically speaks of "pauperism," he also emphasizes that the "laborers' recognition of the (alienated) product as one's own product and the laborers' assessment of the separation from the conditions of (self) realization as something unjust and forcibly imposed (on them), is an enormous consciousness which itself is the product of the mode of production based on capital and which (sounds) the knell to its doom" (Manuscripts, 1857-58). Finally, while correctly noting in Marx's 1844 manuscripts the absence of some of the specific Marxian categories of the later years, Burkett seems not to have sufficiently emphasized two crucial aspects of these manuscripts which would continue to be Marx's central themes in his later writings. First, the manuscripts do stress the social-historical specifity of commodity relations and already criticize the classics for eternalizing them. In the process they also bring out the specificity of the capital-wage labor relation. Second, the manuscripts offer the first outline of Marx's ideas concerning the "labor process" - both as regards the "material exchanges between nature and the humans" and its disruption and inversion by "alienated labor" under capital. These few minor remarks in no way detract from the high qualities of this book. As a splendid presentation of Marx on nature and an excellent critique of many ecologists, including the eco-Marxists, the book should be read by all who are concerned with today's environmental problems but do not see solutions beyond capital.